With tremendous growth in Smartphones across the world, these devices have become the new playground for spreading trojans and malwares and Indian users are at the forefront. According to the report by leading security company F-Secure Labs, India ranks 4th in the world in Mobile Malware, while capital city New Delhi has the highest number of SMS sending mobile malware. The threat report H1 2014 released by F-Secure Labs found that in the second quarter 295 new threat families and variants were discovered – 294 on Android and one on iOS. In previous quarter same number was 277. The top android threat during the first half of 2014 were Trojans that either send SMS messages to premium numbers, or harvest data from a device and forward it on to a remote server. Ransomwares are nasty apps that hold users on ransom for unlocking their devices. Generally, they have been targeting PCs. However, for the first time it has appeared on mobile devices. 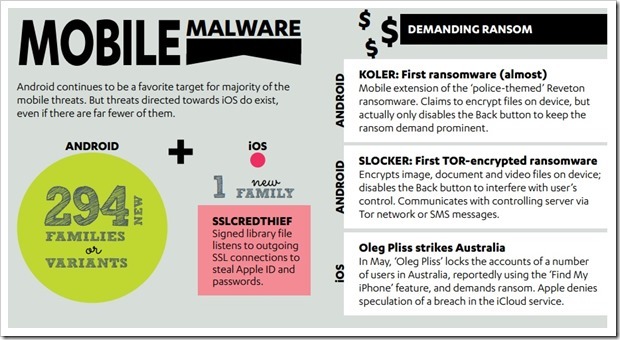 The Slocker malware, which pretends to be a legitimate app, was the first ransomware to appear on the mobile platform. – Are you one of those that think Mac doesn’t need protection? – Malware found in MAC! 25 new Mac threat variants were discovered in the first half of 2014. The report clearly points to fact that whether it is mobile or PC, the threats are increasing and users need to be extra cautious when operating these devices. Make sure about the permissions that mobile apps ask for and when you are downloading a software on your PC, you need to make sure it is safe. Always invest in a good anti-virus software!